- Will withdraw food when running low. - Please chose your longsword && staff. A combination of the pair allows for every attack style to be covered. - Select your Fkey presets for attack style and inventory, if you don't do this correctly it will not work. - Please start inside the room with the catapult with your shield in your inventory. - Equips shield and changed defensive style accordingly. -Any 1 piece food (Doesn't currently support cakes or pizzas) simply start the script with these in your inventory. -Will loot any dropped defenders, go out and show it to Kamfreena in order to get the next tier defender. -Will traverse to the bank and restock on supplied before going back up. - Will stop the script if there are no more supplies in the bank. -Special attacks supported, start with one in your inventory upon starting. Dragon defenders will be very similar to the above but with a few changes. - You must have previously spoken to Lorelai otherwise it won't allow you into the cyclops pen. -Protect from melee can be used and will also use PRAYER POTIONS to restore it's level when low using the formula to ensure it doesn't waste any. On keg balancer it has 1 problem of going through the hard door it keeps going back and fort all the time because of the delay. i think it has the same problem on the shotput game. this is what the debug log is when it gets stuck on the door, it just keeps passing back and forth through it and doesn't doesn't realize that it passed through the door to continue to the keg area it looks like. [00:11:48][KegRoom|Task]:Finding and navigating to the heavy door. [00:11:56][KegRoom|Task]:Passing through the heavy door. [00:11:59][KegRoom|Task]:Finding and navigating to the heavy door. [00:12:01][KegRoom|Task]:Passing through the heavy door. [00:12:06][KegRoom|Task]:Finding and navigating to the heavy door. [00:12:08][KegRoom|Task]:Finding and navigating to the stairs. [00:12:18][KegRoom|Task]:Finding and navigating to the heavy door. [00:12:27][KegRoom|Task]:Finding and navigating to the stairs. [00:12:36][KegRoom|Task]:Finding and navigating to the heavy door. [00:12:45][KegRoom|Task]:Finding and navigating to the heavy door. [00:12:48][KegRoom|Task]:Finding and navigating to the stairs. [00:13:25][KegRoom|Task]:Finding and navigating to stairs. [00:13:32][KegRoom|Task]:Finding and navigating to the heavy door. [00:13:49][KegRoom|Task]:Passing through the heavy door. [00:13:52][KegRoom|Task]:Passing through the heavy door. [00:13:58][KegRoom|Task]:Passing through the heavy door. [00:14:05][KegRoom|Task]:Passing through the heavy door. [00:14:10][KegRoom|Task]:Passing through the heavy door. [00:14:13][KegRoom|Task]:Passing through the heavy door. [00:14:15][KegRoom|Task]:Passing through the heavy door. [00:14:24][KegRoom|Task]:Passing through the heavy door. p.s. this is from the keg area when its out of food and goes to bank it gets stuck some and figures it self to the bank but on the way back it gets stuck in the loop till you click towards the keg area. Sorry guys I’ll check that as soon as I get back to my pc! Uploaded a few tweaks, I missed of a set of brackets when working out when to open the door which was causing the issue. back to having the doors work like a charm, tried them 5 times and walked through no problem each time. Regards to the other door it should only be picking up the keg when inside of the room itself. Even got separate rules for it to check that exact door is open or closed. If you see if again try and get a screenshot for me? Fixed a bug causing it to withdraw all food/potions on certain parts of the script. I got maxed melee on my main at the Cyclopes way back in the day. 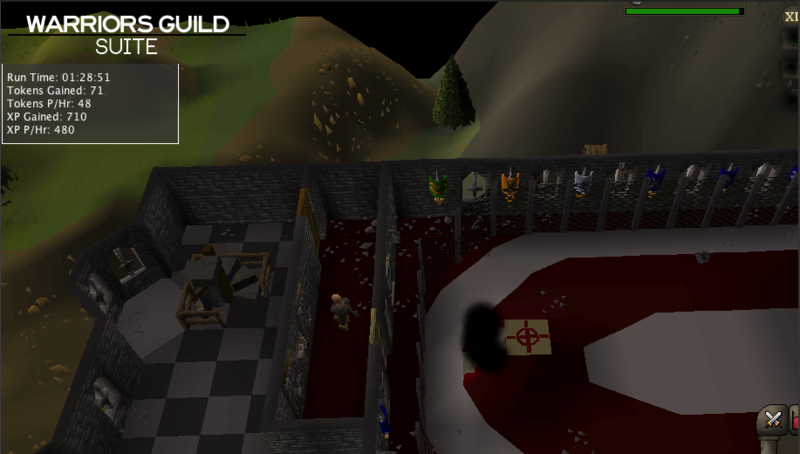 I think I had like 300 rune defenders stashed in my bank at the end of it all. I don’t know what I’m to say to this? I'm sorry I don't have the debug for this, I didn't think to use it. The script works really well for animated armor and bronze-rune defender. So thank you for that! 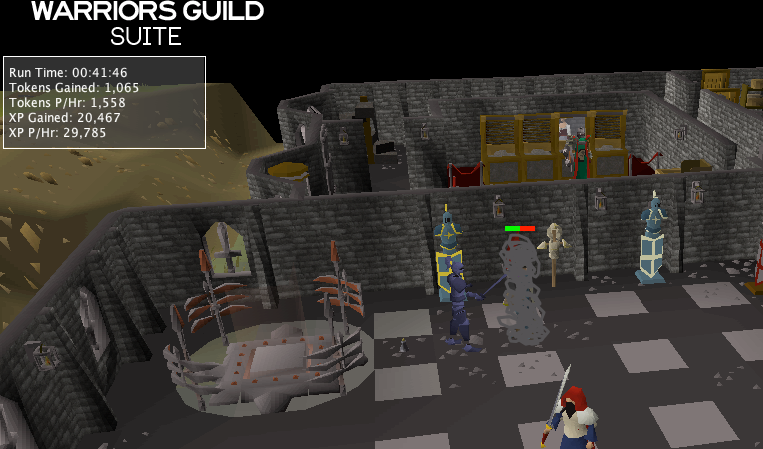 I was using it for dragon defender and was watching the script when the defender dropped. However, it wasn't picked up and started to fight the next giant. (I didn't want to see if it would eventually pick up since I was 3k tokens dry at that point). But just wanted to let you know. Overall, script is great. Thanks again! I got the chance to use this script a bit more extensively today. The kegs I couldn't get to work at all although I gave up pretty quickly. The shotput worked well enough, it's a little botlike but not bad if you do it in short spurts. The banking didn't work however, it got stuck on the stairs after it withdrew a correct inventory. The defenders was working pretty well, however I would add a detection for when you don't have enough tokens to re-enter the room. I got a defender and it left to re-enter but if couldn't because it didn't have enough tokens. Overall it's a fantastic script, just a few bugs to iron out. Well without telling me what part of the kegs doesn’t work I can’t really do much with that? It works for me so I’ll need more info really dude, you’re an sw you should know that! :p you need to have your head, weapon and glove slots empty for it to work. I thought it should only enter the room if there are more than 100 tokens in the inventory, I’ll check it out thanks! Also which stairs, the bottom floor? Hey man, on the Keg script im not sure why but it wont go upstairs from the bank. it takes out the 2 monkfish and 26 energy potions then proceeds to the stairs and stops, any idea what this could be, also i am wearing no armour, weapons, or anything else? I haven't gotten this script to run a full round correctly since your merged them. Hopefully i can get working soon, this is an amazing script! thanks for your hard work on it, i really appreciate it. I’ll have a look, when running into issues it really helps if you run the log with the script so I can see what the issue is but I’ll see what I can find. Found out what the issue was, completely my fault. I had a bracket in the wrong place meaning I was only trying to climb up the stairs when my inventory is NOT full. All fixed now. My apologies for the inconvenience there.